At one time or another, most goods travel on a big rig truck. These vehicles are usually the most cost-efficient way to move freight from one place to another. These trucks also weigh upwards of 80,000 pounds when they are fully loaded. It is very difficult for even experienced drivers to control these machines, even if conditions are ideal. Intercity buses are very busy as well. When it comes to mass transportation, only airlines move more people than intercity buses. Intracity and party/tour buses are quite common as well. Large vehicle wrecks often involve multiple catastrophic injuries. These damages create special legal issues which an attorney must work hard to resolve. Bus drivers, truck drivers, taxi drivers, and all other operators who carry people or money for fares are common carriers in Illinois. These professional drivers have a higher duty of care than noncommercial drivers. This duty applies to vehicle operation. For example, a noncommercial driver can usually proceed through an intersection on a green light with only a cursory check for oncoming traffic. But a commercial driver arguably has a duty to stop at the intersection, or at least slow down significantly, make sure it is clear, and then move forward. The duty also applies to bus passengers. The transportation company is basically an insurer of safe conduct. The duty begins when the passenger boards the bus and does not end until the passenger gets off the bus. The safe passenger duty includes the physical environment. The walkways must be free of wet spots or other hazards which could trigger a slip and fall. Likewise, except in emergency situations, the driver must refrain from moves that could cause passengers to lose their balance. Moreover, a company employee must prevent fights between passengers and take other such action. If all this is too much for the driver, then there should be a monitor or other employee on board to perform these services. The higher duty means that it is easier to establish liability for damages in these cases. Such damages usually include compensation for economic losses, such as medical bills, and noneconomic losses, such as pain and suffering. 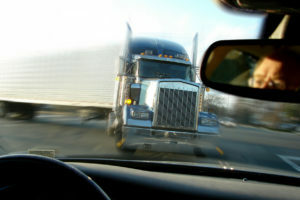 As mentioned, large vehicle collisions often cause catastrophic injuries, such as wrongful death. Illinois has one of the lowest insurance minimums in the United States. So, in these cases, the individual tortfeasor (negligent driver) may not have enough insurance coverage to fully compensate the victim/plaintiff. An Employee: Employees are not just people who receive regular paychecks. Employees are any people that the employer controls, in terms of things like hours worked. So, under this definition, regular employees, owner-operators, independent contractors, and even most unpaid volunteers are employees. Scope of Employment: Similarly, any act which benefits the employer in any way is within the scope of employment. That could include driving an empty vehicle to the garage, because the employer benefits from the free advertising. Other employer liability theories include negligent hiring and negligent supervision. These rules often apply to intentional torts, such as assaults. Large vehicle wrecks usually causes massive injuries. For a free consultation with an experienced personal injury lawyer in Rockford, contact Fisk & Monteleone, Ltd. We routinely handle matters in Winnebago County and nearby jurisdictions.